Beautiful and spacious living room was filled with custom-made bookcases with 8” soffits for overhang lighting, radiator covers. 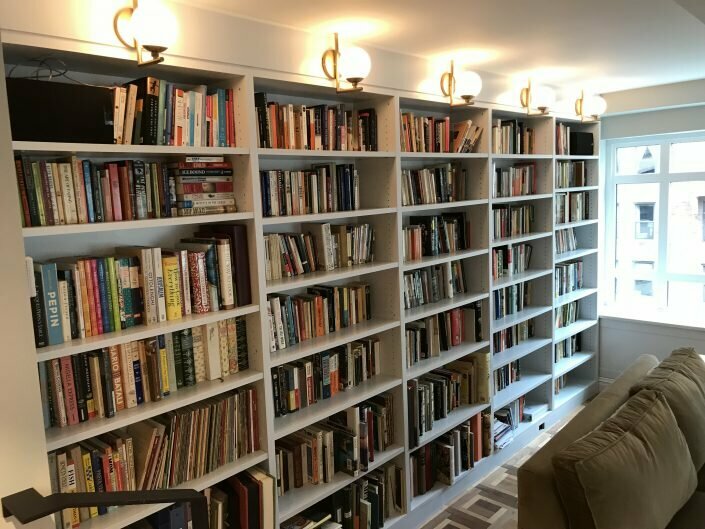 The bookcases consisted of 5 sections on one wall and a single unit on the opposite side; they were made of MDF with Heaven semi-gloss lacquer finish which was matched with Benjamin Moore paint color. All shelves were 1 ¼ inch thick. 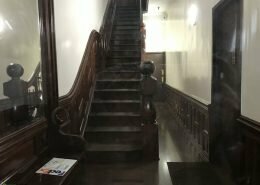 Also, there were 3 sections of the custom radiator covers with removable panels and bases for A/C unit maintenance which were made of pre-finished maple inside and shaker style fronts with the same Heaven lacquer finish on the outside. 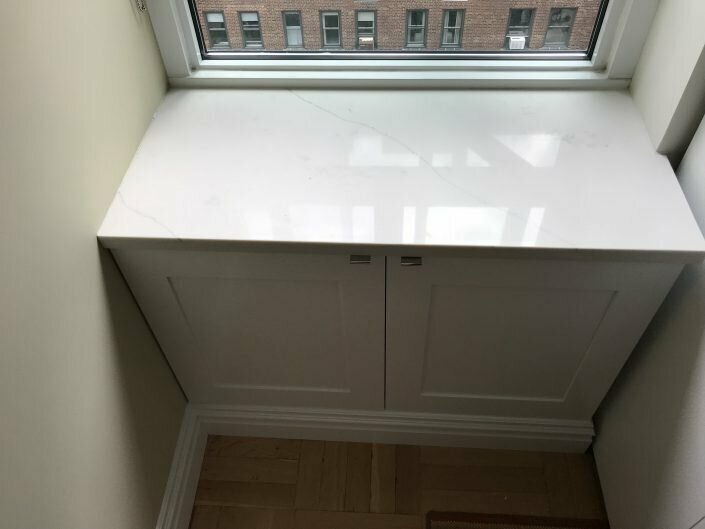 After installation, white Carrera stone was applied on the top. Especially the corner unit became a focal point of that room. Once you enter the living room you can notice a great combination of colors. 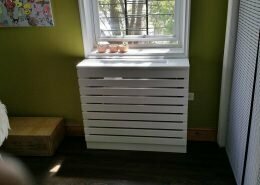 In that medium size master bedroom, we built custom radiator cover on one side, small base cabinet with 2 doors on the other side with drawer unit with shelved in between. 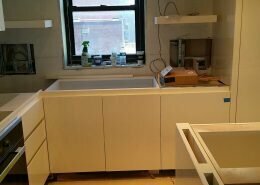 On the adjacent wall, we fabricated a long, 11-foot long drawer units consisting of 4 sections. The drawers in each section were made of cedar plywood, which is very elegant and most important has a very intensive scent. Another advantage of cedar, it is mole/pest resistant; for us humans the scent of cedar is very pleasant, for insects, on the other hand, is repulsive and they will avoid it at any cost. One of the drawer sections was intended for letter and legal-size files. On the top of the drawer unit, there was a 3-shelf bookcase. All carcasses/ cabinet skeletons were made of pre-finished maple. The outside finish color here was called Pistachio from Benjamin Moore, matched to our millwork semi-gloss lacquer finish. In that bathroom, we built 2 units. The main unit, the vanity consisted of 8 drawers and 1 fixed panel, the smaller right across, consisted of 3 drawers. Both were wall mounted. 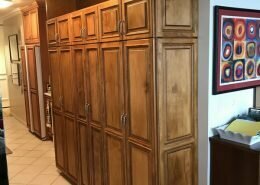 Inside was made of pre-finished maple, outside was semi-gloss White Ice lacquer matched to Benjamin Moore paint with side mounted soft closing drawer slides. The countertop was white Carrera stone. 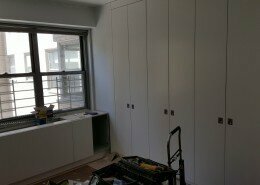 There were 4 closets which were consisting of shelving units/ dividers/panels with coat hand rod in between. 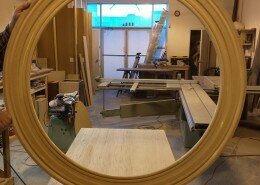 The material that was used was pre-finished maple. 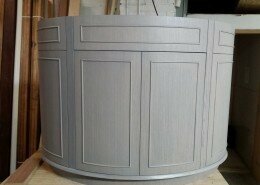 In that room, we built 2 custom radiator covers with shaker style removable panel fronts. The outside finish was Heaven Semi-gloss lacquer. On the adjacent wall, we also built a wall mounted cabinets with flat style door and semi-gloss grey/green looking lacquer. 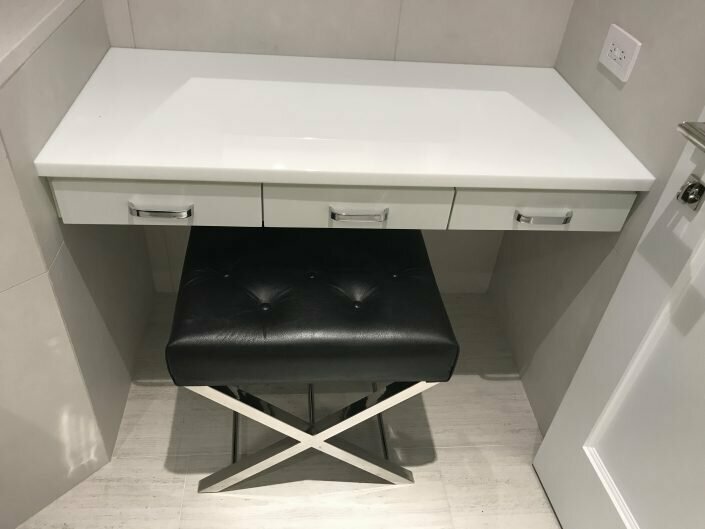 In that compact size bathroom, we managed to build a custom vanity with 3 functional drawers on soft closing drawers slides with 1 fixed panel on the top. 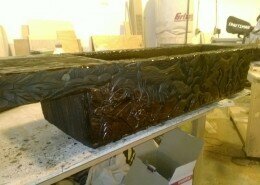 On the right side, we made a small radiator cover with the accessible removable panel. Even though there was a little space, it all came up beautiful. It was built in accordance with the design and specifications provided like the rest of the millwork we completed in this project. The space available was very small, however, together with an architect guidance, we made those custom-built units to fit right in. The material that was used there was white melamine. 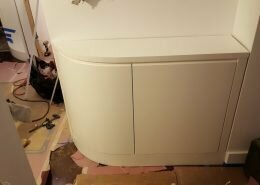 On the left side there was a tall but wide cabinet with adjustable shelves, across the entrance there was a L shaped base cabinet with additional shelving on the top and one more small cabinet right next to the washer and dryer.